Hilary and Scott are such a fun-loving and goofy couple. I loved spending time with them, and also with their bridal party and family. Everyone was great. It was an awesome party full of kind hearted and welcoming people. I think one of my favorite parts of the day was taking photos of Hilary and Scott, with Mt. Hood in all its epicness behind them, then hearing fake camera noises all around behind me. I turn and several of the groomsmen have their phones out and are totally pulling their best fashion photographer impersonations. It was priceless, I’m glad I could help capture that too. 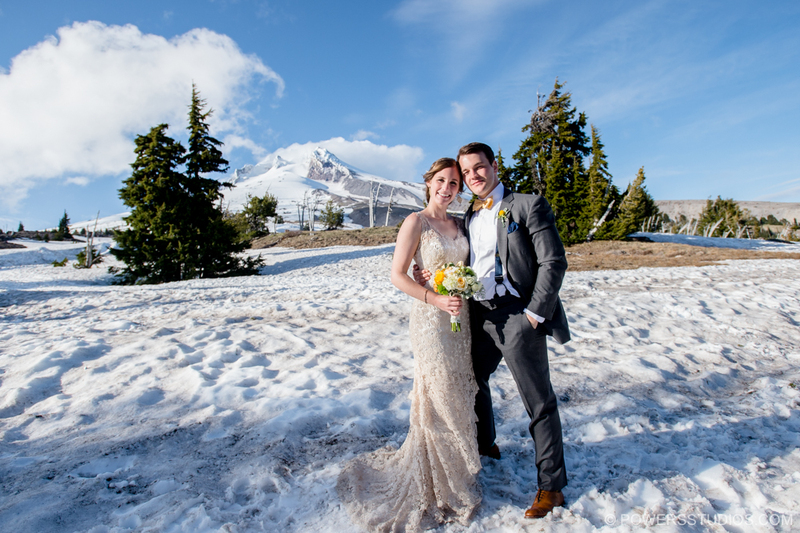 A close second favorite moment was when we were doing whole bridal party portraits up in the snow, when a mountain climber walked up and photobombed the group shot, posing in front of everyone. It’s fun, random memories like this that help make the day just as much as the emotional and poignant ones. Bottom line, Hilary and Scott had a blast at their wedding, and they had gorgeous weather. I’m so glad I could be there for them. Congrats again to you both!